A magnificent, deep blue eye formation located in the middle of the Lighthouse Reef – a small atoll in the Caribbean Sea – the Great Blue Hole is a true geological marvel. Located at 70kms off Belize City (Belize), this 318m diameter sinkhole is surrounded by a ring of corals. Formed during a series of glacial periods, the Blue Hole is composed of a 124m deep underwater cavern, with giant stalactites, stalagmites, and columns, which formed when the cavern was above sea-level. 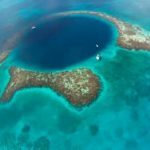 Made famous by the French explorer, conservationist and researcher Jacques-Yves Cousteau, today, the Great Blue Hole is a prime destination for experimented scuba divers and adrenaline-seeking skydivers. Scuba diving in the Great Blue Hole requires a certain level of experience and excellent weather and water conditions. To get to the hole, one must embark on a 3hr long boat ride from San Pedro, Belize. Diving trips can be booked with Amigos del Mar, for a comfortable boat ride and experienced dive masters. Guided by the latter, as you descend in the blue hole, colours will give place to a gloomy hue the deeper you go. You will then have, for only reference, a limestone wall to your left. As you explore the hole, you might even come across Caribbean reef sharks. At 40m deep, the maximum depth you could go, you will encounter the cavern, an underwater natural cathedral. There, you will find yourself exploring an eerie place, where you wander under silhouettes of sharks circling over you, and a dark abyss below you, before slowly ascending back to the surface after a 30min spectacular dive. Although the Great Blue Hole is most commonly experienced through scuba diving, the best way to fully admire the beauty and grandeur of this natural monument is from up in the air with Astrum Helicopters. To add a boost of adrenaline to your view, opt for a skydiving journey over the Great Blue Hole. Since 2005, skydiving over the Blue Hole has become an adventure of a lifetime. Skydive Belize offers a series of thrilling tandem dives allowing you to jump from a Cessna 182 into the warm water of the Caribbean Sea surrounding the Great Blue Hole. You will have the chance to capture the most spectacular videos and photos, before joining a dive boat for a scuba dive. Skydiving expeditions are offered weekly from December to April in San Pedro, if the weather is favourable, as safety is Skydive Belize’s number one priority. Do not wait any longer and book a trip to Belize to meet the Great Blue Hole and enjoy the Caribbean Sea’s many natural wonders! Have you ever dreamt of a sophisticated getaway in a vibrant city, where effervescent culture meets exquisite cuisine? San Sebastián – officially named Donostia (in Basque) – is your dream come true. This coastal metropolis is situated in the Basque region (north-west of Spain), close to the French borders and the Pyrenees. Known for its cobblestoned old town (Parte Vieja), bay-front, cast-iron promenade (Paseo de la Concha), rich culture, Michelin-starred restaurants, and famous La Perla Spa, San Sebastián is your go-to chic getaway! “Exceptional” is the most accurate word to describe San Sebastian’s epicurean scene. Home to more Michelin-starred restaurants per capita than anywhere else in Europe – with two of its restaurants receiving the prestigious three Michelin stars (Akelarre and Arzak) – San Sebastián’s cuisine is worth a special journey. Composed of a vast array of fresh seafood, jamón Iberico (Spanish ham), cider, and pintxos (Basque cousins of tapas), San Sebastián’s food is accessible to all and encourages social gatherings. Varying between €1 to €3 per piece, pintxos (Spanish for spike/skewer) were invented in San Sebastián. Usually served in bars, they differ from tapas mainly because they are presented with a skewer or toothpick, often on a slice of bread. They are enjoyed amongst friends, with a small glass of local Basque cider or wine. This is a selection of the tastiest pintxos bars in San Sebastián: Gandarias, Zeruko, Bar Txepetxa, and La Cepa. Spoken around the West Pyrenees, Basque is the oldest language in Europe and its origins remain unknown. It is spoken by 40% of San Sebastián’s population. And since culture is also shaped by language, San Sebastián lively culture reflects this fact. Designated European Capital of Culture for 2016, the city cultural scene is composed of, among other things, Belle-Époque architecture, Gothic and Baroque Churches, festivals, concerts, museums, and an aquarium. Paseo de La Concha (The Concha Promenade) is without any doubt the city’s most iconic feature, with its white cast-iron Belle-Époque fence. Running along the seaside bordering La Concha Bay on the Atlantic coast, the promenade could be enjoying by foot or on bicycle, passing by iconic buildings, such as Hotel de Londres y de Inglaterra, Palacio de Miramar (Queen Marie-Christine’s summer residence), and La Perla Spa. With its high and low ties, and spectacular sunset, La Concha beach is also a great place to hang out along the promenade. Public and free, one can walk, sit, and swim there, including in winter. One of the most beautiful thalassotherapy spas in the world, La Perla was part of Queen Marie-Christine of Spain summer residence. Located on the Concha Bay and established in 1912, the Belle-Époque architecture spa is not only dreamy but also affordable and quite beautiful as it offers a panoramic view of the ocean. It includes a series of seawater pools that massage with powerful jets of water set at different heights to target key muscles. The spa also includes an underwater gym, a direct access to the beach, saunas and steam rooms, and various massage and wellness services. A spa day at La Perla is a great way to end your classy getaway in the city of pintxos and culture. Get ready to be blown away by Patagonia’s dramatic mountaintop glaciers, and awe-inspiring landscape. Covering roughly one and a half times the size of the United Kingdom, Patagonia is a sparsely populated region located at the southern end of the Americas. Its west and east coasts face the Pacific and Atlantic oceans, respectively. From Argentina’s Los Glaciares National Park to Chiles’s Paine National Park and Tierra del Fuego, you will find yourself at the ends of the earth, in the middle of an immense site of pure wilderness, sculpted rock towers (Cordillera), pristine lakes, dense forests, and impressive silences. Beautiful Patagonia can be explored through spectacular treks and horseback rides. The horse trails vary greatly from flat dirt to steep and rocky mountains. The trip itself can be challenging, but extremely worth it as it offers a unique encounter with many natural marvels. Varying between 2 hours and 10 days, riding tours in Patagonia will take you to the best lookouts while allowing you to experience the region in a rustic and eco-friendly way. Riding your horse by day and sleeping under a spectacular sky full of bright stars when you set camp at night, your ride across Patagonia will bring you closer to nature than ever. You can book your riding adventure with experienced Chilean and Argentinian companies, such as Wild Women Expeditions, Equitours, Pingo Salvaje, and Espiritu Patagon. The capital of Tuscany, Florence will take you back to the Middle Ages and the Renaissance eras, with its maze of backstreets, churches, and truly remarkable art. Follow the footsteps of prolific medieval poet and father of Italian literature, Dante Alighieri to discover the quintessential emblems of this romantic city. Author of The Divine Comedy, Inferno, and La Vita Nuova, Dante presence in Florence is almost everywhere, from commemorative plaques to quotes from his most renowned oeuvres carved in stone along the city’s streets. Dante wrote many of his poems on his favourite stone, the Sasso di Dante, on the Piazza del Duomo. There, he also witnessed the construction of Brunelleschi’s Duomo, beside the Baptistery of San Giovanni. Like Dante many years ago, you can sit next to his favourite spot and gaze at the Duomo Cathedral and the medieval houses surrounding the piazza. Visit the baptistery to admire its lavish golden mosaics and climb up to the dome of the Cathedral to admire Florence from above. Following via Santa Margherita behind the Duomo and its Museo dell’Opera del Duomo – which is also worth a visit to admire its marvellous sculptures by Michelangelo – head toward Santa Margherita de’Cerchi, an 11th-century church where a 9-year old Dante laid eyes on the love of his life, Beatrice Portinari, for the first time. Dante rarely spoke to her, but he loved her deeply all his life. Her death at the young age of 24 pushed the poet toward depression. Although he barely knew her, Beatrice remained Dante’s muse and inspired many of his love proses, such as the famous “Amor, ch’a nullo amato amar perdona” (Love, which spares none of the loved from loving in return) from The Divine Comedy. Adjacent to Santa Margherita, you will find Dante’s House, a museum documenting the poet’s life and oeuvre. Immerse yourself in Dante’s poetry at the Giardino di Boboli, behind the Palazzo Pitti, the main residence of the powerful Florentine family, the Medici. Although not from Dante’s time, this Renaissance garden offers a perfect setting for a reflective and relaxing moment away from the busy Florentine streets. Sitting on a stone-bench under an alley, discover Dante’s proses and reflect upon them, surrounded by the garden’s lush and inspiring nature. Located uphill in the Oltrarno district, the Giardino delle rose is another serene location. Situated on the opposite side of the Arno River, you can access it by crossing the Ponte Vecchio, the oldest bridge in Florence built in the Middle Ages. Once in the garden, you will admire the many roses flourishing in front of a spectacular view of the city and its prominent Duomo. You will conclude your day wandering around the Piazza della Republica, a gelato at hand, trying to imagine how the city looked in Dante’s time, excited to visit the Uffizi Galleries and a Santa Maria Novella the next day. There is a widely held misconception that during the Christmas and New Year’s holidays, Rome’s restaurants shut down and people who don’t have the luxury of eating at home are left to scavenge for food wherever they can get it. While one should expect some venues to be closed and many to embrace limited hours and prix fixe menus, visitors to Rome can eat very well during the holidays. It just requires a bit of planning. Unsuspectingplaces.com is focused on offering customers the best and easiest service available when booking their next vacation. We have partnered with some of the biggest travel companies around the world to ensure you get the most choice and best price when traveling. © 2019. Unsupecting Places All rights reserved.